Roasted phool makhana chaat recipe, a healthy and easy to make chaat recipe, perfect for a tea time snack. I have got phool makhana once from a nearby mini mart but i think it was old stock so i had to thrash that one. Few days back i got a fresh bag of phool makhana and i wanted to try spicy roasted phool makhana and finally ended up in making a chaat by just adding some onion and tomato. It's more like the sukha bhel i posted some years back. Try this healthy snack recipe at home and i will share one more recipe using phool makhana soon. 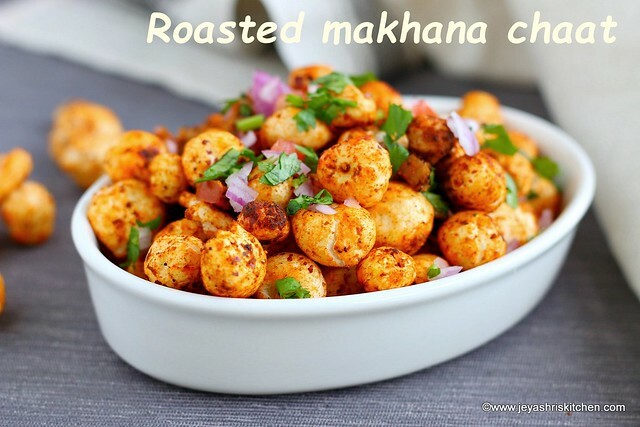 Roasted phool makhana chaat recipe, a healthy and easy to make chaat recipe, perfect for a tea time snack. Finely chop the onion, tomato and coriander leaves. In a pan add oil and add red chili powder, turmeric powder, chaat masala, roasted jeera powder and amchoor powder. Give it a quick mix and immediately add the phool makhana. Mix well and let this roast for 2-3 minutes. Be careful not to burn this. Actually you can consume the spicy roasted phool makhana after this. I made a chaat using that. Transfer the roasted phool makhana to a wide bowl. Add the finely chopped onions, tomato and coriander leaves. Give it a even mix. 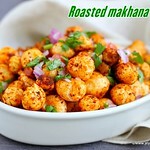 You can keep roasted makhana ready and keep in an air tight container. 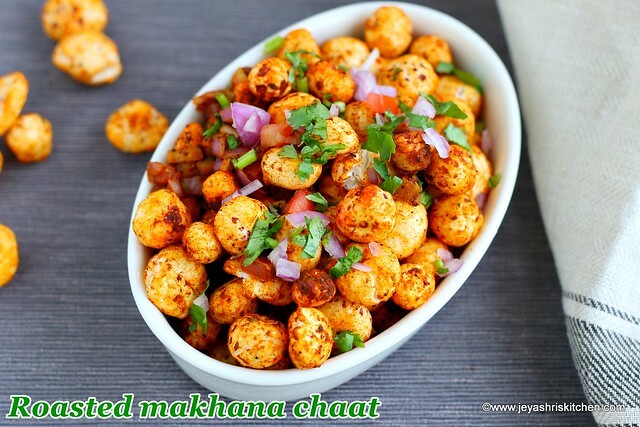 Whenever you want to make the chaat, add the other ingredients and make it. You can add pomegranate also to this phool makhana chaat. If you want green chutney and sweet chutney can also be added to enhance the taste of the phool makhana chaat.